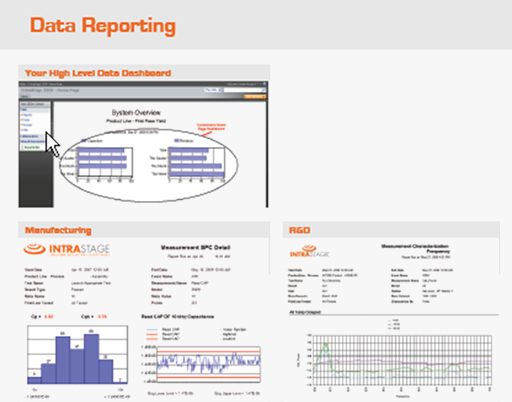 The IntraStage solution is designed specifically to automate the retrieval, storage, reporting and visualization of product test data from manufacturing, R&D, supplier, field and repair environments. IntraStage can be delivered as a “plug and play” device with all software preconfigured so that we can have your data management system working in a matter of hours. Based on industry standards, IntraStage combines the power of the latest server technologies with the database tools provided by Microsoft(TM). The application uses test data adaptors to pull data into the database from any previous or existing test station or ATE. It can do this at automatically predefined times or when specifically requested. You can even enter test data manually using the built in “Paperless Forms”. Once your test data is inside the IntraStage database, it is there for life. 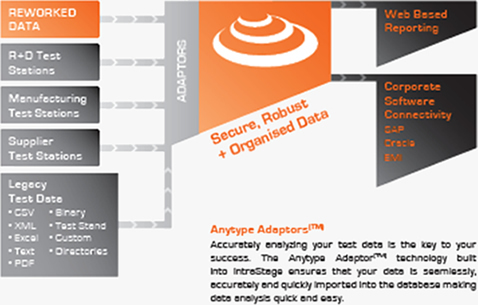 IntraStage was pre-designed to store any kind of data, of any format, from any test or manufacturing environment. We also allow direct input into the database (such as for repair and RMA forms) and can be integrated into common ERP systems such as SAP where the test data can be integrated into work flow information. Now that you have all of your data in a secure, centralized location, the power of IntraStage really comes into its own. You can create your own Meta Data fields meaning that any company specific data can be searched for and compared, this may be a job works number, product and sub assembly part number, test station ID etc. You can filter through any of the data giving you complete flexibility when looking for something specific in this data. You can even schedule automated reports to be run at times to suit you and your business. IntraStage is a solution that empowers you to make critical decisions easily and quickly throughout the product development life cycle. Using a web based interface, IntraStage provides ready to run reports that give you immediate access to all of your test data. You can access any data generated by your in house test systems enabling you to quickly identify trends, failure analysis and yields. You can use the built in QA routines such as Cp, Cpk, SPC and six-sigma to help you identify the main issues affecting product quality. IntraStage is scalable to your organizations needs, whether you are using it in the lab for proof of design using a single development station or rolling it out throughout your global manufacturing facilities where you may have hundreds of test stations and ATE’s in different worldwide locations. IntraStage has no limit to the number of users who can take advantage of managing and analyzing their data, from development engineers’ right through to manufacturing managers. The easy to use, licence free web interface and administered data access means that everyone can play an important part in improving the quality of your products.